If you’re wondering why I always say that, it’s because Andre Greipel is the most hard-pedalling of all the Tour riders. Other sprinters may sometimes be faster, but they don’t have to push the German’s huge and not-particularly-aerodynamic frame through the air. There’s also his gargantuan basking shark mouth, which surely serves as nothing more than an air brake. 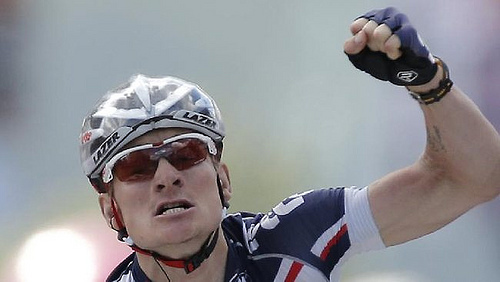 To overcome all this drag, Greipel simply pedals harder. That said, to some extent this win was created long before that distinctive mouth-open surge to the line. Frantic uphill racing in the first hour saw Mark Cavendish dropped and there ended his hopes of a stage win. What does this mean for the points competition? Peter Sagan got into the break for the second day running and hoovered up the mid-stage sprint points. He then managed to finish fourth, even though the break had been caught – no mean feat considering how much extra work he’d been doing compared to the other sprinters. This basically means that he’s still ahead. The Alps, but just two moderate climbs as a taster before the second rest day. Here’s the profile. You’ll note that it’s a long descent to the line. This is ominous. I really, really don’t like downhill racing. It’s too fraught. Far and away my least favourite line of commentary is “he’s really taking some risks on this descent”. Vincenzo Nibali is probably the best descender in the peloton, so he might have a go.